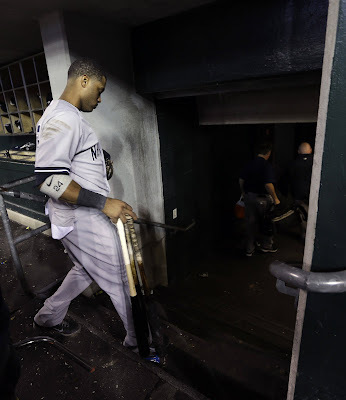 A debate among New York Yankees fans has been heating up over the past few days: the debate to trade Robinson Canó, or extend his contract, to a nine-figure deal, keeping him in the Bronx for the next several years. Some Yankee fans want the Yankees to honor their team's heritage of spending more and more money, always improving the team, never acknowledging any fiscal limitations. Other fans are wary of issues signing players, who are good today, to long-term contracts that will continue to pay them like superstars through their post-prime years. Alex Rodriguez is most often used as the example of this argument, but the truth is there are dozens of examples since the Yankees signed Catfish Hunter on the last day of 1974. Over at the MLBTR Yankees Facebook page, one commenter states: He's a talent that you see every once n a while but if he wants much than I say....let him walk. We're not trying to poke fun at this fan's opinion, but my question is how often is "every once in a while"? Does he mean every few years? Every 20 years? Once in a lifetime? I'm thinking that Robinson Cano is about as good as any second baseman we can expect to see for the next 15 years, at least. There are many ways of measuring Robinson Cano's greatness. I never would have guessed that, over the past 50 years, only 33 second basemen had an OPS+ over 100. More detailed looks will show that Robinson Cano is among the league leaders in OBP, SLG, Hits, and Extra Base Hits. Let's open the floor to discussion... Should the Yankees extend Robinson Cano for the next 5, 6, or 7 years, at an expense over $100 million? Or, should they trade him for prospects, before losing him via Free Agency? as a Yankee? How many more should he have?